Welcome to a new week! 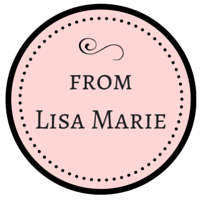 Thanks so much for joining us during our Bloggy Friendship Days last week! Well, I keep hearing about piles of laundry that everybody has to do, myself included - one load washing right now! But I have a laundry giveaway today! Oh no, I'm not giving you my dirty laundry to do, as tempting as that is!! How about some free laundry detergent? Recently, Mom Select sent me a free bottle of Sun laundry detergent to try and review. Let me get all disclosurey (new word made up by me!) and tell you that I am not being paid for this review, but I did receive the laundry detergent and giveaway for free and was asked to review it on my blog. I did try out the detergent. It's called Sun Burst and has a fresh, clean scent. It's also HE compatible. It's cleaning power comes from an ingredient that's plant-based and is considered a biorenewable resource (that info comes from www.sundetergent.com). I did notice the scent - not something I would wear as perfume, but a very strong clean scent. When the clothes came out, they did not smell perfumed as I was afraid they might - they just smelled clean. And one other thing that I noticed was that my whites seemed just a little whiter and brighter, which is something I never notice when washing. Now that is just my opinion, not a claim - you'll just have to try it for yourself! Anyway, I know you - all you care about is what I'm giving away - LOL! 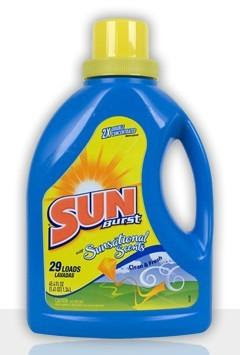 I have five, yes FIVE coupons for a free full-size bottle (or powder if you prefer) of Sun Burst laundry detergent!!! Woo Hoo! It's like I'll be helping five of you with your laundry! Well I won't be coming over and helping you, but I'm saving you money on detergent - close enough, right?? To enter the giveaway, just leave a comment on this post! That's it!! You can enter through next weekend and I'll announce the 5 winners (drawn randomly from comments) next Monday 7/6! Have a great day and feel free to share any good laundry tips in the comments! Love your website, hate doing laundry! As a massage therapist who does her own linens, I go through gallons detergent. This is a particularly relevant "freebie" for me. Fingers crossed! Oh my gosh,chocolate. Where's the scratch & sniff. Ah, such a wonderful smell. Yum! Those who say we can't understand the concept of infinity have never done the laundry for a family with children. oh what a lovely place you have here! CHOCOLATE?!?!?! I've got the chocolate cinnamon bread recipe saved for a rainy day. AND I've been looking for a new detergeant. Thanks for the giveaway! I could definetly use some free laundry detergent! With three boys I do a ton of laundry! Yay! Laundry detergent! If it smells good it will inspire me to catch up on all of my laundry :) Right. That sounds like a great detergent! Hmmm....free laundry detergent I know will somehow make doing laundry more "fun"! So count me in my friend. Big clean smelling size hugs to you! free is good :) I'd love to win! Free sounds good to me! Who doesn't like free! i wanna add my email just in case I happen to win lol.. I'm all for nice smelling laundry soap - fresh, not perfumy. Would love to try this! I wanna win!! I also want some chocolate! 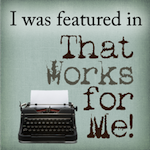 I loved the review and I would like the chance to enter! 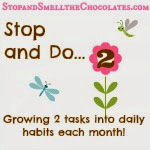 Great idea for encouraging young mommies to keep up with their laundry and helping with the budget at the same time! We love to hug our babies and when they smell good, too, well - that is double the blessing! I have laundry....lots of it...actually LOADS of laundry (slapping leg, laughing! )...I would love some free detergent...I am so easy to please. :) Thanks for another great giveaway. Will be ooto from 7/3 to 7/12 so if I get it you will have to wait until I get back to get shipping info. Thanks for the giveaway! don't love laundry, but Love that I have a washing machine that works! !